b) Therefore, I must do something. 2) I'll likely need to save more, take more risk or shift my asset choices. longinvest wrote: But I am not so naive as not to identify a marketing campaign behind the systematic vocabulary subversion. I think the idea of “passive” investing is largely a marketing pitch sold by firms who do something that is generally a less “active” form of investing and this alternative perspective is constructed in order to draw a line in the sand thereby creating the illusion that less active forms of investing are something totally different from anything more active. Last edited by cjking on Fri Jul 24, 2015 1:52 pm, edited 1 time in total. rgs92 wrote: The irony is that (many) Bogleheads are the very people who understand this stuff and can't help themselves from keeping an eye on all these esoteric financial statistics and the minute-by-minute fluctuations of the markets. That depends on what you do with the knowledge. I have a fairly complex system I use to track things but I like it because it sends me a constant message of "do nothing...do nothing...do nothing". It makes me feel smart while twiddling my fingers. Changing the argument by making up definitions that no one else agrees with isn't going to get us very far. I agree with his definition, but I also agree with you that it's just a matter of semantics and pretty much a waste of time to argue about. It is one thing to advocate an investment strategy; it's another to subvert the vocabulary or push definitions to the extreme, like Faber does in Cjking's quote. According to the new vocabulary, we're all "active" investors, because nobody can invest in the global portfolio of all assets*. I have nothing against the huge variety of investment strategies. I actually thank all the active investors , including high-frequency traders, for making the markets extremely efficient. But I am not so naive as not to identify a marketing campaign behind the systematic vocabulary subversion. I don't view all the rebranding and language as coming from "desperate fund companies" and some kind of nefarious marketing campaign, but maybe that is just me. Not just you, it borders on odd sometimes, suggestion that investment marketers post here as moles, seriously? Every investor is active in some sense but a continuum with important gradations I've seldom if ever seen anyone on this forum try to ignore, and say eg. 3 funds in 401/IRA and rebalance to a fixed % is the same as turning over your portfolio to full discretion of an adviser into all the most exotic investments. Still, liquid mutual fund assets even to the extent they cover the whole market of liquid securities, which as you point out they don't in non-negligible ways, is really not the whole market. For one major thing it's paying for daily liquidity on all your assets you don't intend to touch for decades. Liquidity is good, hence in an efficient market it should cost something. Practically speaking there may be a lack of assets available to a given investor which give an illiquidity premium without bringing along excessive costs or a virtual second job, but failing to ever even ask yourself why you invest with 100% daily liquidity w/ a decades horizon would be incurious, which is a potential pitfall of the BH mentality along with all its more favorable aspects. Otherwise it seems expected return and passive/active tend to line up, though not uniformly of course, as the stronger advocates of passive (liquid broad based fund assets only, fixed %'s) being the more optimistic* about return, and those less sure of the universal superiority of that strategy being the more pessimistic. I'm not sure why that's so, but attributing it to 'marketing' is nonsense IMO and would just obscure why it's actually so. *'I just don't know' seems to often be 'I don't know, but stocks have delivered 7% real for a long time so why shouldn't they from now?' which is not really 'I don't know', but a very optimistic expected return forecast. It is useful to go back to older writings, like a 1991 theorem on which our philosophy is built, to retrieve unambiguous mathematical definitions for words such as "passive", "active", and "market". Most importantly, one can see that the theorem does not assume that there exists a single market of all assets; on the contrary, it lets users of the theorem apply it to whatever market they choose. Of course, certain definitions of the key terms are necessary. First a market must be selected -- the stocks in the S&P 500, for example, or a set of "small" stocks. Then each investor who holds securities from the market must be classified as either active or passive. A passive investor always holds every security from the market, with each represented in the same manner as in the market. Thus if security X represents 3 per cent of the value of the securities in the market, a passive investor's portfolio will have 3 per cent of its value invested in X. Equivalently, a passive manager will hold the same percentage of the total outstanding amount of each security in the market. An active investor is one who is not passive. His or her portfolio will differ from that of the passive managers at some or all times. Because active managers usually act on perceptions of mispricing, and because such misperceptions change relatively frequently, such managers tend to trade fairly frequently -- hence the term "active." Using these clear and precise definitions, Vanguard's Total Bond Market Index fund is a passive fund. It invests in the market of all investment-grade nominal U.S. bonds with maturity greater than one year. That market excludes junk bonds (not investment-grade) and TIPS (not nominal). Of course, it is not 100% passive, but something like 99%, because it might use derivatives sometimes to avoid market impact and sampling when it is difficult to buy all bonds in the index. Critics will amplify this 1% and claim that the fund is not passive; that investing in it is an active bet! Same thing with Vanguard's Total Stock Market Index fund. You'll see it criticized for not being "properly diversified". That investing in it is a bet on "beta", the worst of factors which you should avoid at all costs. longinvest wrote: It is useful to go back to older writings, like a 1991 theorem on which our philosophy is built, to retrieve unambiguous mathematical definitions for words such as "passive", "active", and "market". Most importantly, one can see that the theorem does not assume that there exists a single market of all assets; on the contrary, it lets users of the theorem apply it to whatever market they choose. Okay, if we use Sharpe's definitions that's fine by me. I don't really care as long as we understand what we all mean. Then the market portfolio of US investable stocks and nominal investment-grade bonds implies a certain stock/bond split, so somebody designing a portfolio of US investable stocks and investment-grade bonds who uses 60% stocks is active, seeking to concentrate in the riskier asset of stocks in the hopes of higher returns or something else. In my opinion, defining the universe of securities this way is meaningful if that is what you want to invest in. Regardless of what you call it, the decision to use more (or less) stocks is meaningful and is hopefully backed by some thoughts about why we're doing what we do. longinvest wrote: Same thing with Vanguard's Total Stock Market Index fund. You'll see it criticized for not being "properly diversified". That investing in it is a bet on "beta", the worst of factors which you should avoid at all costs. Are you serious? I don't think I've ever seen any factor investor who doesn't like beta or calls it the worst of factors. Some of them just think that a lot of people have too much of it relative to other stuff. The thing is that "beta" represents "passive" investing. They're saying that lot of people are too "passive"! Yet, the theorem says: it must be the case that after costs, the return on the average actively managed dollar will be less than the return on the average passively managed dollar. This much should be apparent. Alternative weightings for other factor exposure are aimed at beating the passive benchmark, which means that people weighting in the other direction would be expected to underperform. The idea is that many people should want to overweight the superior components (supposing for the moment that these people are right and such factors are persistent enough to improve portfolios), but not everyone can because there's not enough to go around and obviously everyone as a whole owns the market. And not everyone thinks to do it. I still don't understand where this says that beta is the worst factor and that it should be avoided. lack_ey wrote: Okay, if we use Sharpe's definitions that's fine by me. I don't really care as long as we understand what we all mean. Bonds and stocks are two fundamentally different asset classes. It is perfectly justifiable for an investor not to consider them part of a single market. I consider, in my portfolio, domestic stocks and international stocks as two distinct markets. Why? Because international stocks have fundamentally different risks: currency risk on each dividend payment, higher costs, political risks (confiscation of assets by a foreign government), foreign withholding taxes, etc. So, yes I can agree that the choice of a specific asset allocation that is different from the relative weighing of domestic stocks, domestic bonds, and international stocks relative to one another could be interpreted as active, if one defined a single market for the three assets. But, there are good reasons not to do so. In particular, as a Canadian, if I considered these 3 assets as a single market, my portfolio would have to be something like 95% international stocks, 2% Canadian stocks, and 3% Canadian bonds. You'll tell me to add international bonds? Hedged or not? Do you see what I mean when I say that it can make sense to passively invest in three distinct markets? lack_ey wrote: I still don't understand where this says that beta is the worst factor and that it should be avoided. OK, maybe I'm wrong, but I thought that the idea of the Larry Portfolio, for example, was to avoid exposure to beta, to minimize the left tail. Maynard F. Speer wrote: So does your asset allocation match the global market's, or are you basing your decisions on some expectations of risk and returns? What data can you use to help you improve your estimates? If you're asking me, I am at 50/50, having won the game and retired. I spent most of my accumulating phase at 80/20. I had to do it over, I'd choose 60/40. I think one's AA (stocks/bonds) should be more based on an individual assessment of risk and need than the global market split. We have roughly 36% in equities, 55% in bonds, and 9% in other categories, most of which are higher risk and not easy or possible for ordinary investors to employ. However, within bonds we have 23% in riskier bonds (corporates, high-yield and EM) and only 2% in the safest of bonds (TIPS). Now let's take a portfolio of 60 equities%, 40% bonds, and assume 50/50 US/international stocks and 50/50 TIPS/Treasuries (pretty typical - Bogleheads tend to hold more TIPS and to take risk on the stock side). Bonds: without doing any math I would suggest that the 40% in ultra-safe US bonds, half of which are inflation-protected, is at least in the ballpark of 54% bonds that are mostly nominal (real dollar risk) and of which a fair percent are also higher-risk (primarily default risk). Stocks: without doing any math I would also suggest you also get something in the ballpark of a 60% equity portfolio in terms of risk if you add 36% in global equities to 9% in 'other' higher-risk, low-liquidity asset classes (totaling 45%). Basically, if you start looking at the total portfolio risk/return profile across asset classes, the two approaches look fairly similar - the market has more high-risk bonds than a typical Boglehead portfolio as well as more high-risk alternative asset classes. My conclusion: a 60/40 portfolio is probably closer than most low-cost, individually-investable, stock/bond portfolios to the risk/return profile of the global market as represented in the chart above, and does not represent a significant attempt to beat said market. I don't think that means 60/40 is the must-have portfolio and do believe it's fine to tilt based on individual circumstances, but I also think the 36%-in-equities number is misleading if taken in isolation and the global market is less like a 36/54 than it is like a 60/40 portfolio. longinvest wrote: Bonds and stocks are two fundamentally different asset classes. It is perfectly justifiable for an investor not to consider them part of a single market. Whether you call all this passive or not, passive within distinct markets, or whatever, you're making asset allocation decisions, and that's the point. You have to consider all the risks and the returns of different assets, whatever they are, and what they mean for you. If you're consciously loading up on stocks, somebody's doing the opposite. But why? And why invest in bonds instead of holding cash? We have some ideas about the historical track records and the properties of these investments, including risk and return. By integrating knowledge and some level of prediction ("I think stocks go up in the long run" is a prediction, just one that is defined in a different way and less specific than "I think stocks will return 2.6% real as the most likely outcome with anything from -3% to 9% being somewhat likely for the next ten years"—and both predictions can be meaningfully wrong in different ways), we decide on an appropriate asset allocation. Some investors may for example look at current yields of bonds and realize this means something about the future risk and return of this asset class. Other investors look at stock valuations, current dividend yields and buyback yields and whatnot, and decide if that means anything about the risk and return in the future for the asset class. Some investors may think that such things tell us nothing about the future and not use them as inputs when deciding on asset allocations. Others will keep these things in mind to some limited degree, while yet others will hop around investments aggressively as a result. I think there are two main ways to analyze this. By reducing market beta exposure while increasing loadings on size and value, equivalent expected return can be achieved without relying so much on just beta. Value and size won't necessarily do poorly when beta does (actually, value does, to a certain extent), so this concentrated position in small value means perhaps less pain when the market falls. By reducing the amount of stocks in the portfolio, there's a higher floor of safer assets, less potential losses to sustain. In any case, the Larry Portfolio is not avoiding beta. It is reducing exposure relative to what many people own. In fact, it has more market beta than value. You can avoid beta if you want (and pick up other factor exposure) by going long-short, say with equity market neutral funds. IIRC market beta has been better in most markets than value and size. lack_ey wrote: Whether you call all this passive or not, passive within distinct markets, or whatever, you're making asset allocation decisions, and that's the point. You have to consider all the risks and the returns of different assets, whatever they are, and what they mean for you. 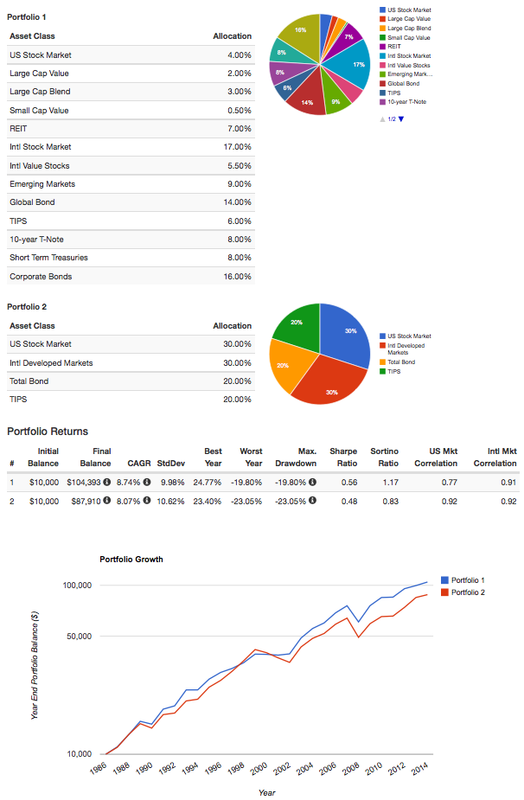 Making an asset allocation choice, then implementing it using passive total-market index funds, and keeping turnover low by directing contributions to assets below target, or taking withdrawals from assets above target, and maybe rebalancing every few years, if the overall allocation has drifted too far from target, can hardly be qualified as active investing, as some would like us to believe. Yes, each investor makes choices. But each investor has personal objectives. I've decided, in the past, not to put all my money in stocks and bonds; my wife and I invested a significant amount of money into a home that we use for shelter. To be "new-definition-passive" investors, should we have limited our investment to the market weight of REITs, and bought REITs diversified internationally, instead of a home, and tried to find shelter within our tiny parcels of REIT ownership? This new fad of qualifying people using static (fixed or sliding) asset allocations and investing in total-market index funds, as "active investors betting against the market" is simply ridiculous. Last edited by longinvest on Fri Jul 24, 2015 5:20 pm, edited 4 times in total. Thanks @Maynard - you did what I should have done and ran it through a backtest, and I'm pleased to see the results! If you still have the page up, maybe you could try a portfolio of 30% US stock, 30% International, 20% Treasuries (or Total Bond), and 20% TIPS as well. For the global comparison, I think high-yield is a fair proxy for EM debt, and SCV or microcap for private equity. Also, I noticed you used mostly US bond categories, but it looks like the Backtest Portfolio function on PortfolioVisualizer also offers global bonds. Except ... you literally cannot hold the total-market portfolio as described in the chart above, which means you are absolutely forced to make at least some 'active' decision as to how you replace the parts you cannot hold. Some of these decisions may be more active than others (e.g. holding safer bonds and taking risk on the stock side) but some are inevitable for an ordinary investor with typical options. lack_ey wrote: If you're consciously loading up on stocks, somebody's doing the opposite. But why? And why invest in bonds instead of holding cash? We have some ideas about the historical track records and the properties of these investments, including risk and return. By integrating knowledge and some level of prediction ("I think stocks go up in the long run" is a prediction, just one that is defined in a different way and less specific than "I think stocks will return 2.6% real as the most likely outcome with anything from -3% to 9% being somewhat likely for the next ten years"—and both predictions can be meaningfully wrong in different ways), we decide on an appropriate asset allocation. My point is that the typical individual Boglehead investor with a 60/40 portfolio isn't really 'loading up' much if at all once you add in the (inaccessibility and) risks of private equity and real estate as well as the risks of corporate, high-yield, international and emerging market bonds. There may be a few (mostly forced) active choices in there, but mainly for simplicity, taxation and accessibility of asset classes. In short, for someone who makes the 'active' decision to hold a portfolio of a handful of low-cost mutual funds, there is not a significant tilt toward risk assets in a 60/40 versus the total global market portfolio. I think it's pretty intuitive - 36% equities + 9% risky/illiquid alternatives gets you to 45%+ 'risky assets', then some risk from other bond types jacks it up more, putting you at least in the effective range of 60%. lack_ey wrote: Some investors may for example look at current yields of bonds and realize this means something about the future risk and return of this asset class. Other investors look at stock valuations, current dividend yields and buyback yields and whatnot, and decide if that means anything about the risk and return in the future for the asset class. Some investors may think that such things tell us nothing about the future and not use them as inputs when deciding on asset allocations. Others will keep these things in mind to some limited degree, while yet others will hop around investments aggressively as a result. That's a whole other range of possibilities, but not really relevant to what I'm trying to claim - or if so, that illustrates how people can be truly hands-on 'active' investors relative to the quite 'passive' and close-to-market-risk/reward approach of holding a typical 60/40 Boglehead portfolio. If there is a spectrum of passive vs. active in which passive means 'the most passive possible and closest to market risk/return that an ordinary human being with ordinary means can achieve' then I'm suggesting the 60/40 portfolio I cited is about as close to that end of the spectrum as you can get and other approaches you are suggesting are (in some cases much) more active. I'm not sure which conversation thread is going on now, but I didn't mean 60/40 as any kind of real example. If you don't think that's tilted much compared to the global portfolio, then how about 80/20? The exact split was besides the point. Some allocations are meaningfully more or less risky than the market-of-all-sorts-of-assets portfolio, or even just global stocks and bonds, and people use some of these and for good reason. Noobvestor wrote: Thanks @Maynard - you did what I should have done and ran it through a backtest, and I'm pleased to see the results! If you still have the page up, maybe you could try a portfolio of 30% US stock, 30% International, 20% Treasuries (or Total Bond), and 20% TIPS as well. For the global comparison, I think high-yield is a fair proxy for EM debt, and SCV or microcap for private equity. Also, I noticed you used mostly US bond categories, but it looks like the Backtest Portfolio function on PortfolioVisualizer also offers global bonds. To be truly accurate I think it would, there is a lot of money sloshing around there. It might also include cash. Not investments we consider "cash" that earns interest or a rate of return. Actual, hidden in mattresses cash that is simply put aside, not earning anything. I can't even imagine how much physical cash is held around the world, by people unsure of what lies ahead. fortyofforty wrote: It might also include cash. Not investments we consider "cash" that earns interest or a rate of return. Actual, hidden in mattresses cash that is simply put aside, not earning anything. I can't even imagine how much physical cash is held around the world, by people unsure of what lies ahead. For how long will equity performance be below the historical average? You know the historical average INCLUDES bad years and bad decades, right? During the next 20-30 years, the bad years will be followed by good years, and we will likely get the historical average without doing a darn thing. Last edited by HomerJ on Sat Jul 25, 2015 12:11 am, edited 1 time in total. I'm always up for some antics, but it's so fundamental to the conversation that we cannot even talk about investing at all if we use different definitions for the word "market". So the benchmark has to represent the same level of risk in order to show how much alpha you're really adding .. Otherwise it would be as simple as adding a factor tilt and adding leverage .. Now how you deal with tactical asset allocation would be more of a practical issue: is it worth following the strategy, or would it just be easier to split my investment 50:50 stocks and bonds? 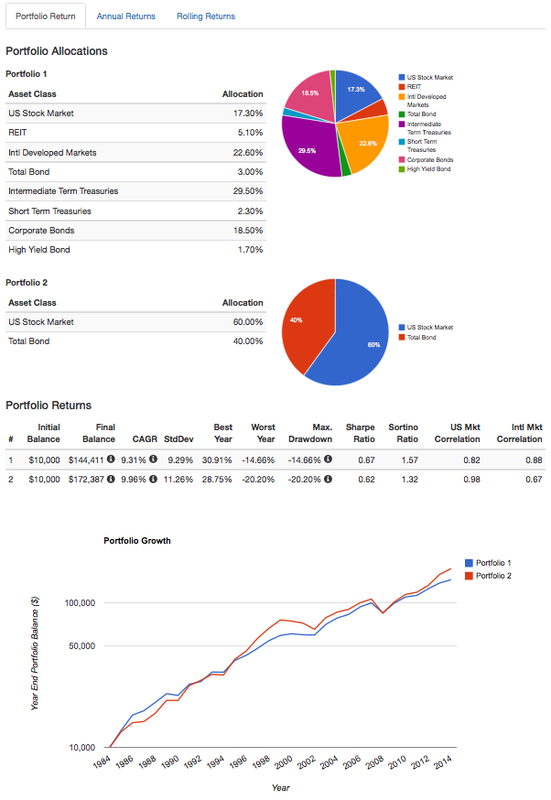 I have held Vanguard LifeStrategy Moderate for over three years. Other than systematic withdrawals every month I have made no transactions. My tilted, active, beat the market strategy seems to be working pretty well. I guess the folders in my filing cabinet do not have the same labels as yours. The past decade has looked pretty good for someone 'staying the course' and not trying to get too tricky with their portfolio. Options and other derivatives cancel out to zero within the market of publicly traded assets. The market of publicly traded assets in contrast is long stocks and bonds, even though the issuers outside that traded market are short and they also cancel out in the bigger picture. There’s a world of assets not just a world of publicly traded financial claims on assets and that can be a practical consideration. For example the pie chart giving 'real estate' as 5% must be referring to REIT's and similar publicly traded claims on real estate assets not the massively larger market in closely or individually held real estate. Investors who do or don't hold real estate directly may be significantly differently positioned compared to the whole market of assets, and that’s a practical asset in which to invest for many. I realize this line of reasoning can get out of hand (then how about my lack of position in private small business in Africa? ), and I personally have no problem treating 60/40 global stock/US bond as some kind of default for practical purposes of financial asset investing, though I still really don't 'know' that 'the market' means the stock market. But there are BH’s who’d still insist on being called ‘passive’ where even the stock portion is all in one country. IMO that’s an active decision, but there are always active decisions of a sort to make even to come up with a portfolio you subsequently seldom change. But if some get upset with the word 'active' in that context because they feel the word should only mean some (in their opinion) greater form of ‘tilting’ or should only mean constantly churning around a portfolio or paying someone else to, what’s in a name? Johno wrote: But there are BH’s who’d still insist on being called ‘passive’ where even the stock portion is all in one country. IMO that’s an active decision, but there are always active decisions of a sort to make even to come up with a portfolio you subsequently seldom change. In other words, you are defining "active" in such a way that there is no such thing as "passive". If making any decision at all about investing is "active", then there's zero need to even use the terms "active" and "passive", because we're all "active". Do we now need to come up some new words so we can differentiate between the different types of investors? HomerJ wrote: In other words, you are defining "active" in such a way that there is no such thing as "passive". If making any decision at all about investing is "active", then there's zero need to even use the terms "active" and "passive", because we're all "active". Well, personally I think active or passive tends to be more of a continuum than an either / or kind of thing. The "perfect passive" portfolio would be an exact match of what the world is actually holding. There are plenty of other portfolios I would still describe as being "mostly passive" without being the "perfect passive" portfolio as they have small but non zero amounts of decision making embedded therein. For the most part when having discussions on this board I stick to the standard terminology though that doesn't match the way I think about it myself. In my view there's a continuum with a real point of highly active, and at least a theoretical point of totally passive. But I think the example such as I gave are practically relevant. Those who choose index stock funds say in half the stock market, the US (which has generally been considerably less than half) are IMO making an active decision, pending adoption of some other terminology to describe that kind of decision which doesn't mislabel it 'strictly passive'. I'm not saying that's a provably wrong decision. But they are less passive than those seeking a more complete balance in assets, though more passive than those trading individual stocks. And perhaps the second distinction is more important than the first. But passive isn't a meaningless term, just mainly a relative term in the real world, IMO. And I don't see the grave potential for harm if we just recognize it as such. So far as I am concerned, "passive" is investing in a cap-weighted index. To say that passive means an asset allocation of every imaginable global asset is just silly. Okay, let's play a game of passive vs. active. I'm not trying to prove a point and am just wondering where people are going with this. I'll list a bunch of scenarios and you tell me if it's active, passive, something in between, or whatever you'd like. 1. Holds U.S. stocks only, no international. 3. Dials down stock/bond split from 60/40 to 40/60 after a bull market, close to retirement. 4. For bonds, buys and holds 10-year Treasuries to maturity (other than to sell some for rebalancing). Each year, buys some more 10-year Treasuries. 5. For fixed income, uses CDs instead of Treasuries when CDs yield more. Cap weights corporates and stocks, etc. 6. Holds Vanguard LifeStrategy Moderate Growth and does nothing. 7. Holds DFA global allocation 60/40 portfolio (this is tilted, omits some more securities based on screens) and does nothing. Leeraar wrote: So far as I am concerned, "passive" is investing in a cap-weighted index [fund]. Exactly! * This perfectly matches the spirit and the letter of William Sharpe's theorem about the arithmetic of active management. * Of course, we're assuming that one doesn't start to speculate using it, like a cap-weighted index ETF day trader. I had to add this, because otherwise someone would have brought up this silly counter example, just to contradict you. Leeraar wrote: So far as I am concerned, "passive" is investing in a cap-weighted index. longinvest wrote: Exactly! * This perfectly matches the spirit and the letter of William Sharpe's theorem about the arithmetic of active management. In 1964, Bill Sharpe demonstrated that, at equilibrium, the portfolio that promises the greatest excess return per unit of risk is the Global Market Portfolio, which is composed of all risky assets in proportion to their market capitalizations. Since the Global Market Portfolio represents the aggregate holdings of all investors, it is the only true passive strategy. All other portfolios, including the ubiquitous 60/40 portfolio of (mostly domestic) stocks and bonds, represent very substantial active bets relative to this global passive benchmark. Regardless of how anyone wants to define the strategy as being 'active' or 'passive', those aren't labels that have any value to me. But having reasonable diversification, low cost, and low turnover is something I think is worthwhile. There are 'active' funds out there that do a good job as well, but why pay extra for a manager if you can capture the return more effectively at a lower cost, and arguably less risk? For me, one of the big drivers to leave an individual stock portfolio was how low cost some of the index funds had become. If Vanguard's index funds were 20+ basis points, I'd probably still be buying individual stocks. A passive investor always holds every security from the market, with each represented in the same manner as in the market. Thus if security X represents 3 per cent of the value of the securities in the market, a passive investor's portfolio will have 3 per cent of its value invested in X. Equivalently, a passive manager will hold the same percentage of the total outstanding amount of each security in the market2. That's clear enough and actionable. The total global asset portfolio cannot be held by anybody. I dare you to try buying a share of my personal home, just to meet your criterion of having a proportional share of every asset on Earth to be truly passive! Last edited by longinvest on Sat Jul 25, 2015 3:42 pm, edited 2 times in total. Listening to the folks here trying to label passive investing active, reminds me of the Watergate hearings in the Mid 1970's where one Legislator quipped. "That if an Elephant walked into the room, there would be some people here that would say; wait a minute that might be a mouse with a glandular condition". I mean, ultimately it doesn't matter what you call it, just that you understand what you're doing and why and that it works. Broad funds that are diversified, cheap, and tax efficient are pretty nice. What to get and how much? You have to make some decisions, and these are guided by a number of inputs. lack_ey wrote: I mean, ultimately it doesn't matter what you call it, just that you understand what you're doing and why and that it works. Broad funds that are diversified, cheap, and tax efficient are pretty nice. What to get and how much? You have to make some decisions, and these are guided by a number of inputs. Passive market-weighted index funds allow us to beat the aggregate return of active investors in the selected market. That's why Jack Bogle created index funds! But, for my sentence to be true, one must use the proper definitions of "passive" and "active"; the definitions found in William Sharpe's theorem. Otherwise, the sentence would be false. It would be false to expect a not-market-weighted rules-based fund to be guaranteed to beat the aggregate return of non rules-based investors. Yet, rules-based funds like to label themselves as "passive". As it appears that this was not sufficient; now the new trend it to try labeling passive funds (or investors using them) as active. longinvest wrote wrote: According to the new vocabulary, we're all "active" investors, because nobody can invest in the global portfolio of all assets*. No. The [global] cap-weighted portfolio of investable assets is the one and only passive portfolio. That's just elementary theory. OTOH, it has become a marketing strategy to sell active strategies as 'passive investing'. Vanguard (USA) is not innocent. According to Wikipedia it is the largest pension fund in the world. Adding (iShares) Global EM bonds and Global Reits you can invest in the Global Market Portfolio. I don't really care what kind of marketing companies do to get bandwagon investors, or the definitions, other than to understand people's perspectives. I guess nobody took me up on the "is it active or passive?" game. I really don't know how different people would categorize those 10 things. You decide how to position yourself relative to what's out there. If you want to lose to the market portfolio by a very small amount for a given market (which can't be directly invested in cost-free in practice), a broad market index fund is a great way to do that. As you say, it will beat the after-tax/costs average return of other players in that space. As practical tools for investors, index funds are great. There are no real guarantees about any future results, but we have to guess about future stock and bond returns, among other things. They may or may not be enough to meet any particular person's goals. We also have to guess about the returns of assets within a market. Some people are convinced they have a statistical edge for a priori higher expected returns (or risk-adjusted returns) by running some screens or rules, be it through a fund or not, deliberately deviating from the market. Others don't think that's the case. There are a lot of people who are wrong or get unlucky and fall short in attempts to beat the market. Realistically, can any of us exploit the market to various degrees? Maybe, but I wouldn't be very confident in my own ability there. I don't care what label you use, but I don't see a very strong distinction between doing allocation between asset classes and doing allocation within asset classes. If you base investing philosophy on definitions by Sharpe and then segregate asset classes in your mind so that you can think of passive and active implementations within these spaces, then sure. What is the process for choosing between asset classes, then, and figuring out an appropriate weighting? It's a matter of starting points followed by subjective decisions. The various things you listed range from mildly to moderately active for the most part, but are generally more passive than anything. I could go through your list but I don't think it would add much to the above sentence. A good basically-passive starting point is probably something like a 60/40 (global) stock/bond portfolio, which as we've seen through some backtesting has behaved quite a lot like an idealized global portfolio that is (as someone said) beautiful in theory but not investable in practice. Beyond that, you can start to see changes, tilts and omissions as 'active' choices of various kinds, but compared to individual stock picking, market timing, etc... well, again, it's all on a spectrum, and those are much further toward the other end. On the flip side, making minor tilts but then staying the course is going to put you toward the passive end of that spectrum. It is important understand one's own tilts, of course - people who hold only US are tilting quite a lot from a closer-to-default position, for instance, that is readily available via low-cost, broad-market, investable index funds (e.g. Vanguard Total International). Likewise a 100/0 or 0/100 portfolio is quite tilted, etc.... Like everything else, a decision of that kind is up to the investor, but it's good to know what you're tilting away from or toward and what the associated risks may be. But I digress. Anyway, I jumped in mainly because there was some sentiment that a slight-majority-stock portfolio was way riskier than a (semi-theoretical) global market portfolio, which I found misleading. If someone wants to be 'as passive as possible' a 60/40 is a good place to start. What is the process for choosing between asset classes, then, and figuring out an appropriate weighting? IMHO, you start with the total investable market, see what low-cost, tax-efficient, and relatively-simple options are available to you, then start making practical decisions around that and/or other subjective factors. I think you're making it sound harder than it is. It's also worth noting that for many people the goal is actually not to beat the market, but to preserve capital or offset other kinds of risk, so active != greedy necessarily. Is LEXCX "passive" ? It hasn't traded a stock since 1935.
lack_ey wrote: What is the process for choosing between asset classes, then, and figuring out an appropriate weighting? I don't think that there exists one answer that fits everybody. That's like asking: How do I choose a carreer? There are general principles that one can use, but every individual has to make his own choices based on his particular circumstances. The investor first decides on their choice of asset allocation between fixed income and equities, to balance risk and return by apportioning a portfolio's assets according to an individual's goals, risk tolerance and investment horizon. The investor then decides how much exposure to foreign markets is appropriate. Never bear too much or too little risk. lack_ey wrote: I guess nobody took me up on the "is it active or passive?" game. I really don't know how different people would categorize those 10 things. Use index funds when possible. It is generally not possible to use index funds in place of CDs (given their specific characteristics) or a liability-matching TIPS ladder (to meet one's specific objective of getting a precise risk-less inflation-adjusted amount of money on specific dates). Is this use of CDs or TIPS active or passive? Does it matter? The "passive" vs "active" is only relevant when one wants a guarantee to beat "active" investors in the aggregate. Last edited by longinvest on Sat Jul 25, 2015 6:55 pm, edited 2 times in total. Whenever I think of medical professionals (particularly: surgeons, who could suffer some injury that takes them out of the game) I always am amazed at the risk they take (particularly: debt and time spent in school) but it's for a potentially very high reward, which is ultimately an individual choice to deviate from whatever a more 'median' career path might be. The difference, of course, is that a career is much less about money than investing is - it's what you'll spent the majority of your time doing for decades of your life, thus very personal. The outlined path (pick your risk tolerance) makes some sense to me but always feels a bit too abstract and difficult to determine. After all, it is hard to know one's own risk tolerance in advance or how much return one will need. At the very least it benefits from a starting point and some brackets within which to operate, hence my advocacy of a 60/40 or similar as a default from which to tilt (based on personal/subjective factors) and my frequent citation of Graham's 75/25 and 25/75 range of possibilities allocations toward equities vs. bonds/fixed income, which conveniently aligns with the notion of never taking too much or too little risk. You can call a rose an elephant, but it makes conversations between two human beings very difficult if one of them continues to ask the other to smell his elephants. I won't post anymore in this thread. I am sincerely sorry I ever got involved with it. My apologies if I offended anyone. The context and previous statements (I blame my lazy writing here, sorry) is that it doesn't matter what people call it as long as they understand what they're talking about and referring to. The problem is that—even aside from people being difficult or trying to prove certain points or advance some agendas—I don't think there's all that much consistency with how people use the words. Because there is ambiguity, it's better for everyone to avoid obsessing over categorizations that aren't even helping us anyway. There also seems to be some oddly emotional baggage attached to certain words and ideals. Besides, "is _____ a _____?" is generally the wrong way to analyze choices and actions. That depends on your desired AA. I have Vanguard LifeStrategy Moderate. You can look up its four components for yourself. Yes, I will grant that an AA that is based on the total global market may have a better risk-adjusted expected return (before expenses) but you can get there with either active or passive strategies. I think a combination of TSM and TBM get you close enough so it does not much matter if you add International or tilt to REITS, etc. By the way, a "passive" "bond fund" may be a tautology. A friend in our local Bogleheads chapter tells of touring Vanguard in Malvern, PA. The bond department is much larger (in terms of desks) than the stock department. He said that TSM, for all its billions, is managed (monitored) by two guys each with two display monitors, in one cube.